There hasn’t been an update for a while. Things were put on hold until I moved flat (which recently occurred). 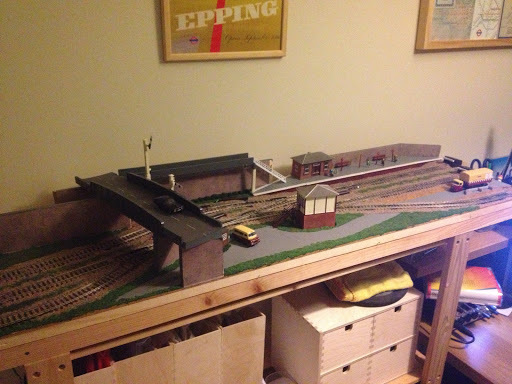 So rather than talking about wagon weathering as suggested in last episode (and I will do soon, I promise), I will be talking about moving flat and how this has affect my Main Layout and Salford Chapel. 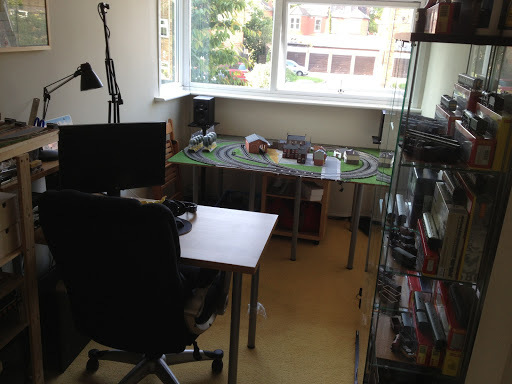 I now have something of an office/studio/workshop, whatever you want to call it (perhaps it should be called Man-Room) dedicated to, and amongst other things, my layout(s). My original objective of Storability is now less important. In fact the layout can now be fitted on something semi-permanent. – I’m always reluctant to make something fully permanent in case I change my mind about something, want to move things, or actually do require space again in the future. Buy a frame: A quick search of Google suggests that it is completely feasible to purchase just a frame for model railway baseboards. These are more on the expensive side and there’s a feeling of out sourcing the problem to someone else rather than coming up with a better alternative on my own. Possible idea – frame with folding legs. (Imagine without baseboard). Build a frame: I could build it myself. 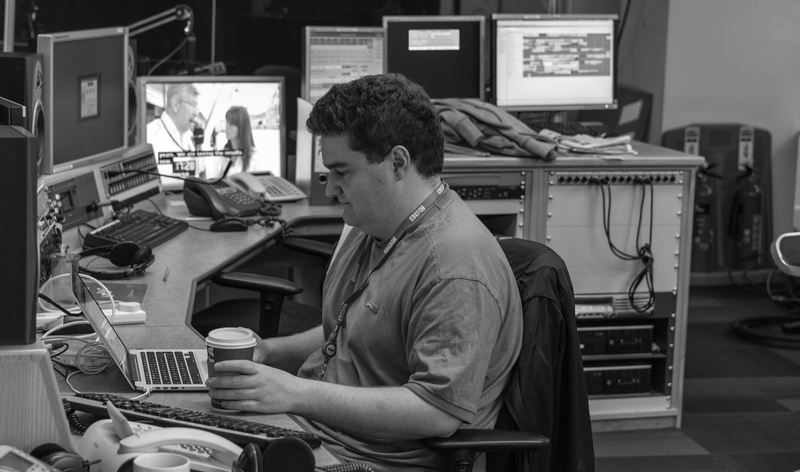 A bigger issue with a frame is it’s rather inflexible and more permanent than I’m willing to make it. I’d have to therefore factor in folding or detachable legs into the frame equation making things liable to expense and complication. (I really don’t like complication). The legs cost £2.50 per pack. 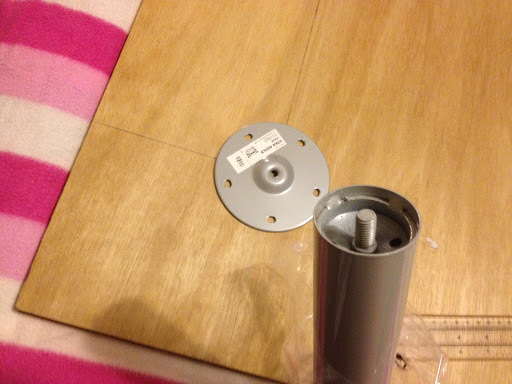 In a pack you get one leg, one mounting disk and the necessary screws. So we’re looking at £20 for 8 packs (remember I have 2 separate boards so it’s 4 legs per board), which considering some of the alternatives is the most cost effective simple solution. 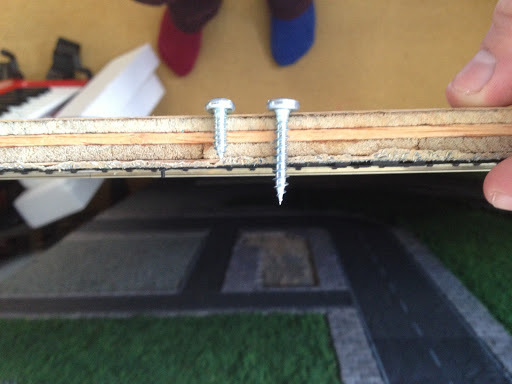 One minor setback is the screws that come as standard (right) are far too long for my board. I popped into B&Q and purchased some shorter ones (left). 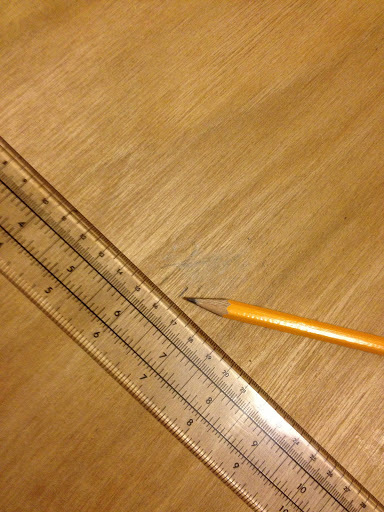 You’ll want to get self-tapping screws, which will ram themselves into your baseboard far easier than normal ones. The alternative is to drill pilot holes (a hassle). 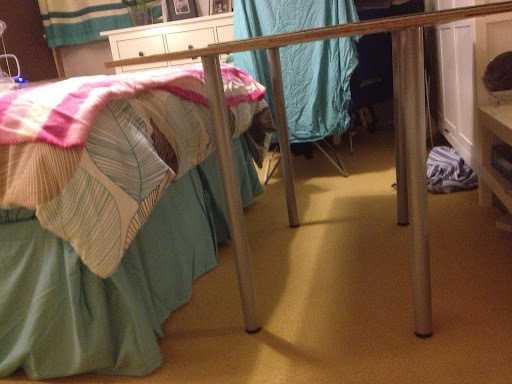 I’ve laid my board track side down on a blanket on the bed. This will cushion the force I will need to apply to screw in the metal disks for the legs and ultimately protect the track. 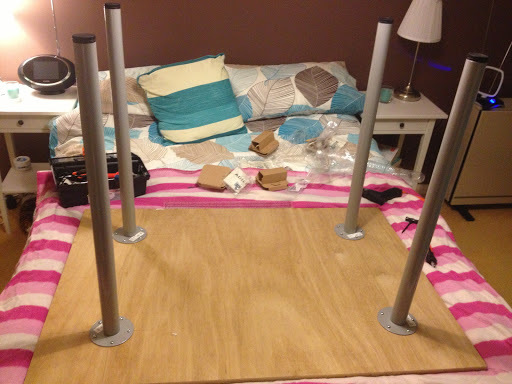 Hopefully you’ll not have to do this if you’re building your base-board-IKEA-solution first. First decide where you want to place the disks. If you’re starting from scratch you can plan this hole operation from the start with more precision. 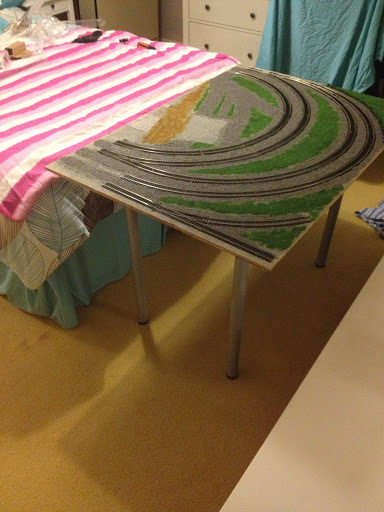 Because I’m doing this backwards and my track is already laid, I want to avoid attaching the disks bellow points – where I may want to add motors, wiring and things that require drilling at a later date. This optimum location was about 6 ½ inches from each edge. I then measured and marked out each disk position. A TWIST GIMLET. 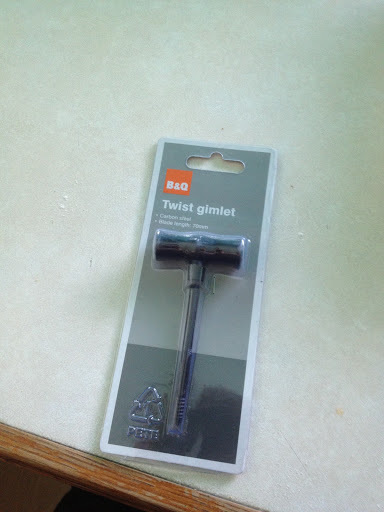 Possibly the most exiting name of any tool you’ll ever find. It did the job just as well. I’ve since learned that it’s actual job is to drill small pilot holes in wood by hand. And, well that’s what I’m trying to do. 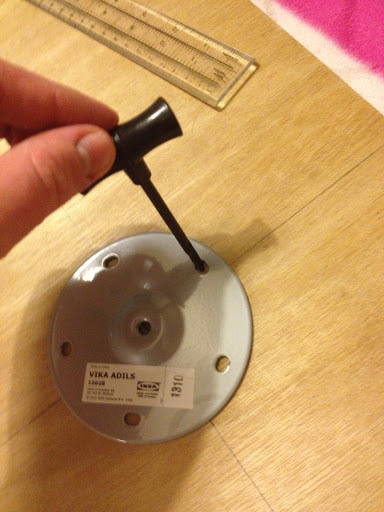 Next, make sure the disc is lined up with your pilot holes and simply pop in the screws. 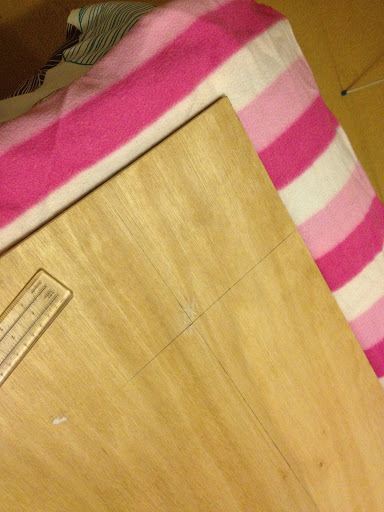 Now my baseboard is ply wood, which accepts screws, nails and twist gimletage with relative ease. If you’ve got a denser wood it might not be so easy. Even so, you’ll need to apply a fair bit of force for the screw to take. I found a mixture of using my electric screwdriver and a ratchet screwdriver were best for the job. And that’s it. Nothing to it really! 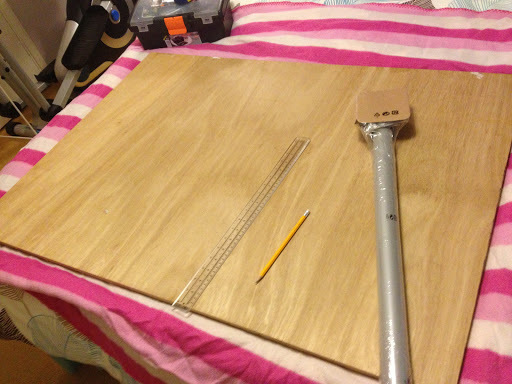 I’ll be able to detach the legs and store the boards as before should I need the extra space for guests or need to move the boards at a later date. And there both boards sit in Man Room with aforementioned glass display cases for rolling stock!